This document will explain how to create an anchor tag and how to link to it. Anchor tags allow you to jump to a specific location on a page. 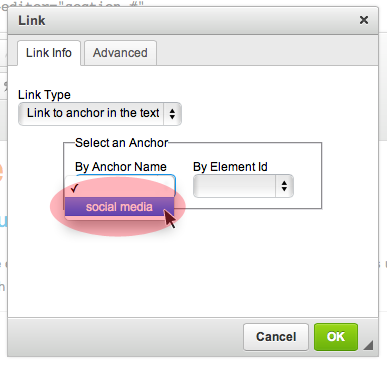 Creating an anchor tag and linking it is a two step process. 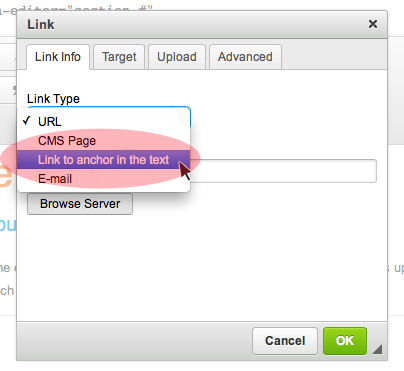 First we will show you how to create an anchor tag, then we will show you how to link to that specific anchor. Select the text you would like the link to go to. Go up to the Anchor link icon and click it. A window will pop up and this is where you name the anchor. Name the anchor in the and press the green Okay button. You now have created an anchor, but now you have to link to that anchor. Select the text that will be the link. I have selected some text on the top of the page, because the anchor was made on the bottom of the page. Select the Link icon and it will popup a window. Click on the menu arrow and select “Link to anchor in text”. Now you can click on the menu options and select which anchor you want to link to. Select the one you just made. You can make as many anchors on a page as you want, so the list to choose from could range from a few to many. When you have selected the one you want to link to, press the green Okay button. You are done, you have now created an anchor link. As you can see below, you can tell where an anchor link is because it will have a red flag next to it. If you want to know other ways to link URLs, emails or images check out these documents: Creating URL and Email Links and Linking an Image.